Interesting trends emerge as the pink boots collaboration beers are being served. Taproom take overs are scheduled in prominent, mainstream places; bars only recently opened to all but the most well known craft beers. The Oak Bar, at Boston's rather brahmin Fairmont Copley Plaza plans to have 8 lines of pink boots beer on in 4 days. This is hardly an enthusiasts night at Cambridge Common. Beer brewed by Women to celebrate the tradition, progress, and future of female brewers (brewsters) appeals to everyone. If Pink Boots beers are a gimmick, it's effective only because we as a society have allowed ourselves to establish some nonsense gender biases. There's nothing novel about women brewing. Pre-industrial brewing, was a domestic task, and traditionally women's work. Even Abigail Adams, perhaps colonial America's most erudite woman - based upon surviving writings - was a farmer/brewer. It's true that industrialization shifted beer making away from the home into factories. Money and education formed strong barriers of entry to women, at least on the ownership and management side. Brewery labor involved a lot of heavy lifting, and little pay. At the same time textile factories actively recruited the women who wanted to work. This division may have established a patriarchy of sorts in brewing and other fields that appeared traditional by the mid-20th century. The early microbrewery movement had contempt for many industrial brewing practices, intrinsic sexism among them. One doesn't have to look far on any list of prominent figures in early craft brewing to find Kim Jordan, co-founder of New Belgium Brewing. There are countless women in craft brewing who are less well known, but successfully building businesses and making great products. 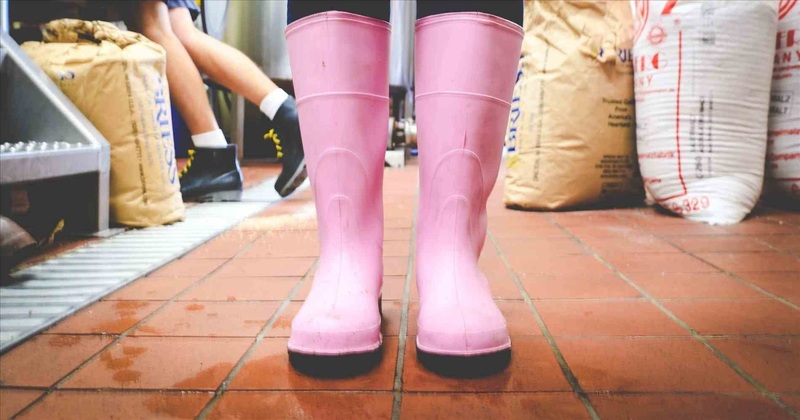 The Pink Boots Society is the brewing industry's professional organization promoting and educating women who work in the field. It funds scholarships, a networks women to exchange technical, and entrepreneurial knowledge. The society has made International Women's Day its' occasion for annual According to a map on PBS' site, 230 breweries world wide participated in the 2nd Annual International Women's Day collaborative brew. Participating beers were formulated with Palisade, Simcoe, Citra and Loral hops but not to a specific style of beer. Plenty of room was left for local character. The society is based in the US, as were most of the participants. The society has chapters across the country, and advocates for events in every state. The event was hugely successful in the north east, and on the west coast. I'm not sure what's happening in the middle, ignoring noteworthy pockets of beer renaissance in Colorado and around Austin. In Massachusetts, tap take over's with 7-8 participating beers are scheduled across the state at Row 34, Rail Trail, Foundry, Oak Bar, and Gulu Gulu. According to MA Brew Bros' 24 bay state breweries made a Pink Boots Beer. That's 10% of the global participation. Beers are getting canned and distributed hear. In MA, we're all in on women in brewing. It's also a highly competitive space, and visible limited release beers are a key part of the market. There have been a few tap takeovers in California at the Cider Junction, Buffalo Theory, and the Capital Hop Shop. It's hard to get excited about 3 events in the middle of a very large state. Were the hops a little too New England for West Coast brewers? I'm a little surprised that a PBS takeover hasn't occurred in Seattle or Portland, despite the PBS' roots in the Pacific North West. I guess the community isn't well organized. East leads west here. Does under participation in the midwest reflect a different demographic in the industry? Kalamazoo, what's up with you? Abundant microbreweries startle visitors from out of town, expecting to find only Bell's in the recovering rust belt city. I'd expect no less than 3 participating beers from a city with it's own beer week. Where's the pride? Did all of western Michigan's brewing women depart to warmer climates? Is under participation structural? The Indianapolis chapter appeared to arrange a single event for the state of Indiana* in at Sun King. This brewery has great draft distribution in the city for event beers, including a few brewed for specific conferences and conventions. Sun King's name is a bit unfortunate for an event about female empowerment, but I'm glad they participated. The brewery leads the city's with a vibrant and expanding beer scene. The Indianapolis brewing community even includes female owned Scarlet Lane. I don't doubt that Indy could have fielded a great team of pink boots beers. The state-wide team up might undersell the numerous women in its industry. It shouldn't be remarkable that women brew beer, or that women are entrepreneurial. Evidently, I'm surrounded by pink boots and am privileged to think nothing of them. They are just boots in a brewery to me. If pink boots are shocking to others, then it is time to inform and inspire. I'm glad that the Massachusetts community is fulfilling long standing tradition of being a beacon on a hill. 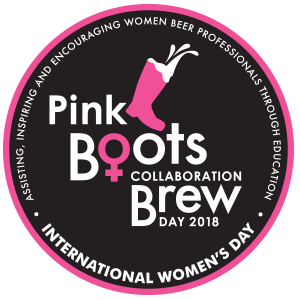 The pink boots symbol is fun, and the international women's day brew is a great reason to think a little about the people behind the beer. I look forward to enjoying this tradition for quite a while, and hope that the rest of the nation gets to experience it the way we do here: as a community celebrating creators. One hopes that the Pink Boots society will provide some guidance for small breweries operated by one or two guys with beards for ways to show solidarity on next year's Women's Day. Should they buy some pink wellies, dress in drag, and try to break instagram? Might there be a mentor-ship program to place accomplished female homebrewers in the brew house of a gender limited brewery for the day? *Hunter's Brewing in Chesterton, IN participated as well. However, it's not even in the same timezone as the rest of the state. I'm from away. I cannot or will not explain the region.